It’s that nostalgia thing again, you see. I distinctly remember my Godfather telling me “You’ll be just the same in years to come, it’s unavoidable.” as I doubtless, rolled my eyes and gazed heaven-wards, as he and my Father embarked on yet another wartime eulogy of misty-eyed proportions. Of course now, I yearn for those words again, their tales and their anecdotes that at the time, although so innocuous and to a young boy, ridiculously vapid, percolated into my subconscious only to re-emerge decades later in waves of glorious and golden memories. I recall back in the 70’s the pervading and alluring aroma of our local smokehouse, perforating the back alleyways and side streets of our seaside town, the oakey exhaust from the smoker spilling from under the corrugated tin roof and seeping into the atmosphere. A beautiful and entrancing tang which I’ve never tired of recapturing. Kippers, Smoked Cod and Haddock, Sprats and Roes were all favourites, that our local fishmonger Godfrey Thorpe would purvey and all invariably found their way, to our kitchen, where as a rule, weekly, we would indulge in one or the other, always accompanied and adorned by local dairy butter and the obligatory, fresh, white, flour-dusted crusty rolls from the bakery next to the fish shop. Bloaters were my Father’s weakness though and he’d wax lyrical about their stronger and very slightly gamey taste, I loved them too and still do, although not as frequently as their more ubiquitous and gutted cousins. A brief phone call with Chris Wightman (the supplier of most of my finny needs) this morning, established that he’d only just removed a batch from his smoker and confirmed my suspicions that it was high time the “Yarmouth Capon” got a mention here on my pages. The Bloater, another cured form of Clupea harengus, has been with us in its current guise since the 1700’s. 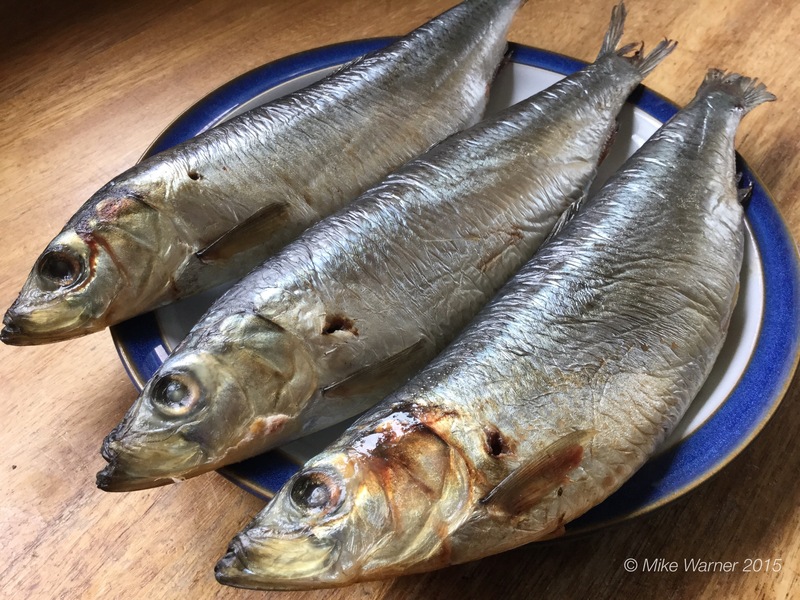 Its predecessor the “Red Herring” was hard salted and hard smoked (up to two days ) to increase longevity for export, the ensuing colouring being reflected in the name. It’s said that the Bloater then came into being by a chance and temporary salting from a fisherman who subsequently hung them in a chimney. The resultant luxuriantly rich flavour ensured its continued popularity and Gt Yarmouth in Norfolk became synonymous with its provenance. 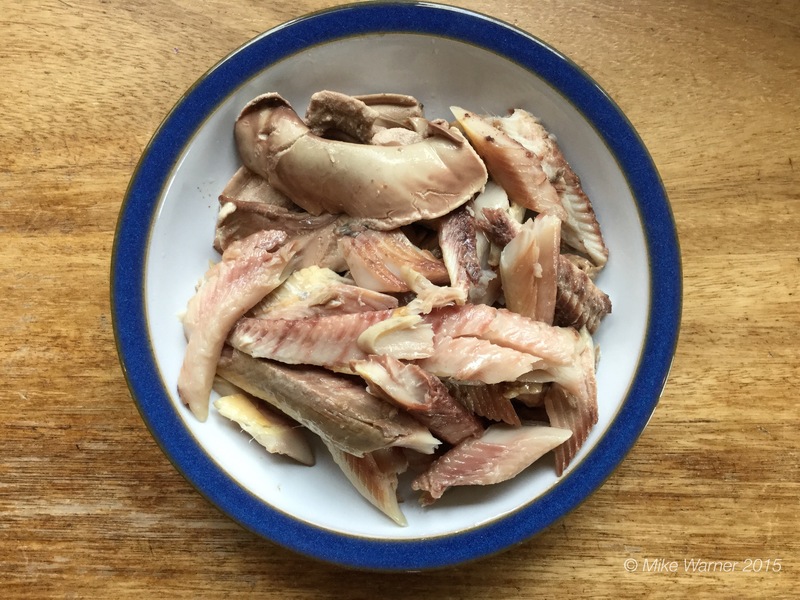 As to the differences with other cures they are several and notable, the main one being that the fish are cured and smoked ungutted. The salting needs to be light as does the smoke- generally no longer than 8-10 hrs. This ensures the delicacy of taste and texture which is their hallmark. Because of this “lighter touch” the Bloater however, does not possess much of a shelf life. Best eaten the same day of smoking, their unctuous flesh provides a memorable and distinctive experience that once captured by one’s senses, refuses adamantly to leave. 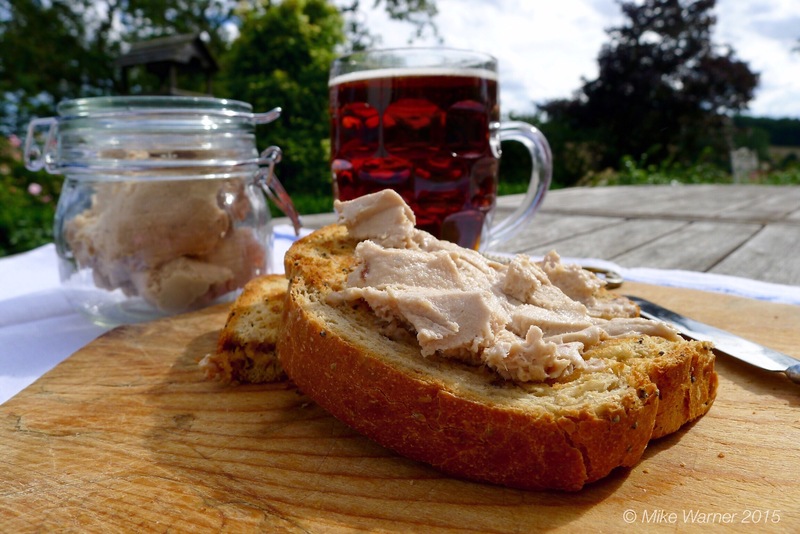 One way of distilling the flavour though and to prolong the life of this wonderful sensation, is to transform the meat into a pâté or paste, which will keep adequately, refrigerated, for up to 3 days. 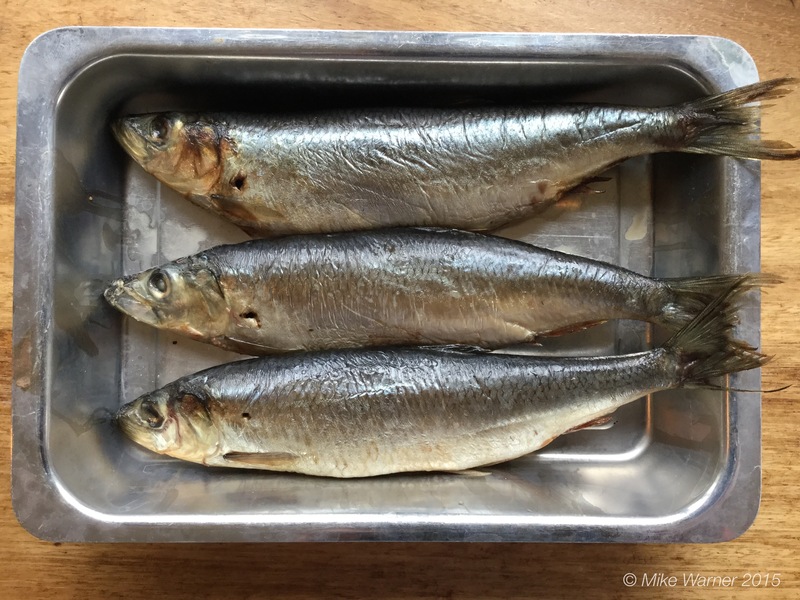 The task of transmuting the fish into the richest and most delicious of spreads is an incredibly simple one, but one that achieves colossal effect for the minimal amount of labour invested. Bloater Paste is, to me, very desirable. Its history can be traced throughout the warp and weft of English culinary folklore since the Victorian era. 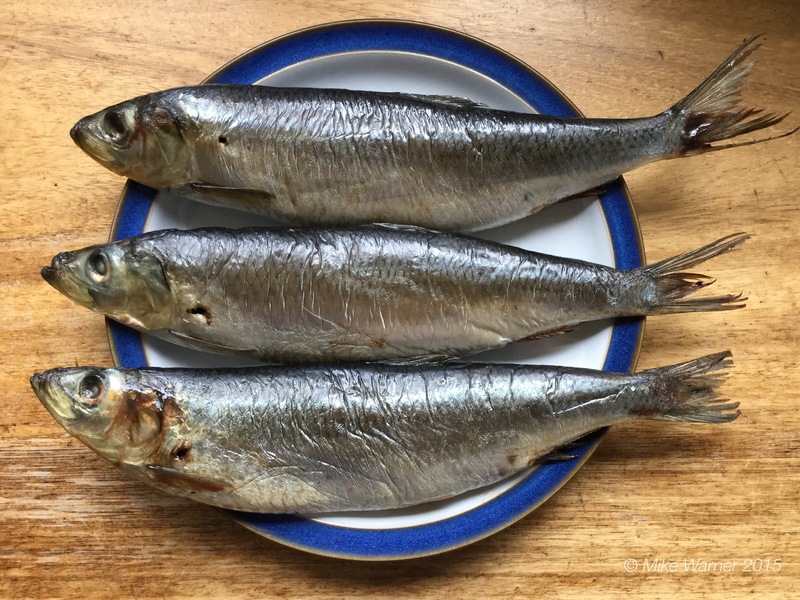 The iconic and world-famous Shippams brand became hugely popular in the 20th century and introduced consumers to the wonderful Bloater taste inland as well as the coastal regions. The Chichester-based butchers company continued to produce the paste in large volumes and J Sainsbury also offered an alternative, packed in delightful and now very collectible stoneware pots. So with three beautifully scented Bloaters, acquired fresh from Chris’s smoker it was with abounding enthusiasm and expectation that I decided to use the recipe for Bloater Paste formulated by the hugely influential and much-loved Jane Grigson in her timeless book English Food, although I’ve added the Cayenne for personal taste. It’s essential that the Bloaters are cooked lightly and not overly so. Gut the fish first, removing the entrails and membranes, but reserving any roes for inclusion in the mix. Leave the fish to cool and then gently flake the flesh off the bone using your fingers. Don’t get too precious about the finer “hair” bones as they will disappear in the making. Put the fish (and any cooked roes) into a processor and add the butter in cubes. Also add the rest of the ingredients and blend up together until the consistency of the paste is desirable and spreadable. Taste and season again or add more lemon juice for personal perfection! Serve with warm, fresh (preferably home-baked) Granary, Wholemeal or Soda Bread toast. (And if you’re like me a pint of your favourite local bitter). I could murder some of that right now. Lovely. My Grandfather – a tailor – wold get bloaters from a customer in Gt Yarmouth – I think they were called Woodgers or Widgers – he called them “high-dries” because they were hung up high in the chimney and therefore drier. This was back in the 1950s-60s I think – no idea when the company ceased trading. That’s a great story! My mate Chris @maximusfishing does them really well. I’ve got someone picking up a box of 10 bloaters for me on Saturday. They are coming from the last working smokehouse in Lowestoft. I’m looking forward to it, I haven’t had bloaters for years. Bloater paste here we come. Next Post “Deck to Dinner”- Celebrating our Seafood.